Product information "Qubino Din Dimmer"
The Qubino DIN Dimmer is a rail mounted dimmer for bulbs or fans. Besides the DIN Dimmer can meter the energy of the connected devices. 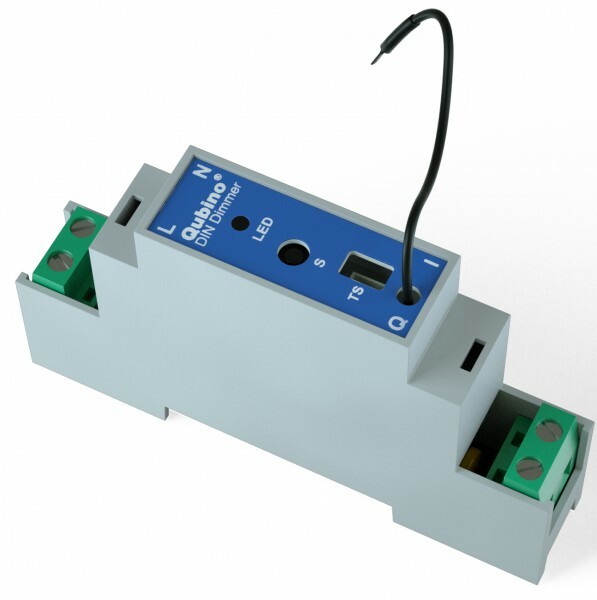 The DIN Dimmer is installed on the DIN rail and is controlled by Z-Wave or manually over a toggle switch. The DIN Dimmer can be installed inside the junction box of your house besides the common electrical installation. On one side the DIN Dimmer is connected to a lamp and on the other side to a toggle switch, which can switch the lamp manually. Furthermore the DIN Dimmer can be upgrade with a digital temperature sensor. The Qubino modules upgrade you common switches with Smart Home Z-Wave technology. Unmount your installed switches. Connect the Qubino module with your existing electrical installation. The mount the switch on the flush box again. Now you can connect your lamp, fan or heating with a Z-Wave gateway and automate them. Related links to "Qubino Din Dimmer"